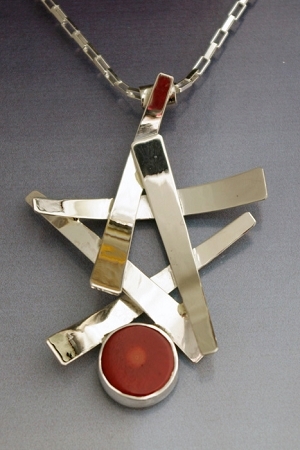 Silver Wisps Jewelry - This is an abstract handcrafted modern sterling silver pendant featuring a round red Coral. This One-of-a-Kind statement necklace comes with a 18" sterling silver long box chain. This Sterling Silver pendant is from our "Wisps of Silver" collection. The shiny silver is accented by a freeform coral (polished natural shape). This pendant includes an 18" sterling silver long box chain. Designed, signed, and hand made by Aaron Rubinstein and Modern Art Jewelry .